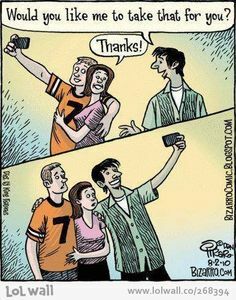 When defining "The Selfie" it is easy to grasp the surface meaning of the word. 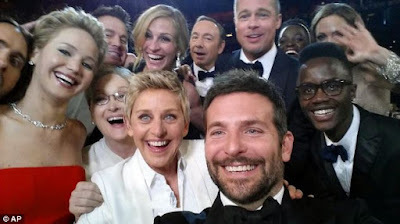 Pop culture celebrates the selfie genre on social media platforms across the board for the act of self portraiture that elicits some level of self confidence, posting a photo of oneself, while perhaps insecurely fishing for compliments or the less-cumbersome equivalent of likes, follows, favorites and retweets. 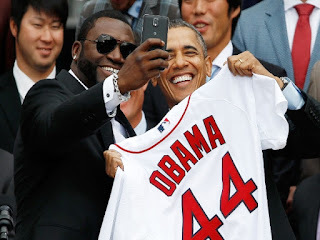 However, taking a more profound look at "The Selfie" as esoteric of an idea that is, we can find in the digital era of social media both connectivity and dis-connectivity. The essence of this practice is never candid, but an intentional expression of the self. The appeal comes from the control the photographer has over how they represent themselves to the public. Even if the portrait taker seeks gratification from peers, there is a poetic empowerment that can be felt through the celebration of one's presence in their environment. David Ortiz of the Boston Red Sox takes a selfie with President Obama. Where moments in time are ephemeral, we age drastically and change physically over the years; the photographs we take are a documentation of time and place. We capture a serene connection to our past and that which surrounds us. The knowledge that the eight of our very finger can encapsulate this memory is powerful, so the deliberate use of this tool to capture ourselves is inherently beautiful. However, when a flood of images acts as each individual shouting "I am here!" collectively, it often amounts to dissonance and becomes white noise. It is important to remember, not all pictures are worth a thousand words. Is how you present yourself a powerful impression or entirely unimpressionable? This body of work looks at today's technology and the selfie practice in both a cynical and existential light. "The Selfie" can be viewed as heavily existential as it affirms the existence of oneself. Similarly, shadows remain evidence of our physical self. Spilling on the floor where it is dragged weightlessly across the earth, our shadows are our traveling companions on a bright and sunny day, or a reminder of where we stand on nights illuminated by streetlights. Our shadows capture our body language and posture, acting as a second indicator of our moods when looked upon carefully. Notice our shadows can be caught in the act of nail biting, slouched over or standing up straight, each a statement about our emotional state. More outright, our shadow is an indication of or presence, it bares our shape elongated or shortened by the surrounding light and objects it is cast upon. Darryll intentionally captures his shadow intwined with that of his girlfriend's to showcase this exploration of self through reflection. 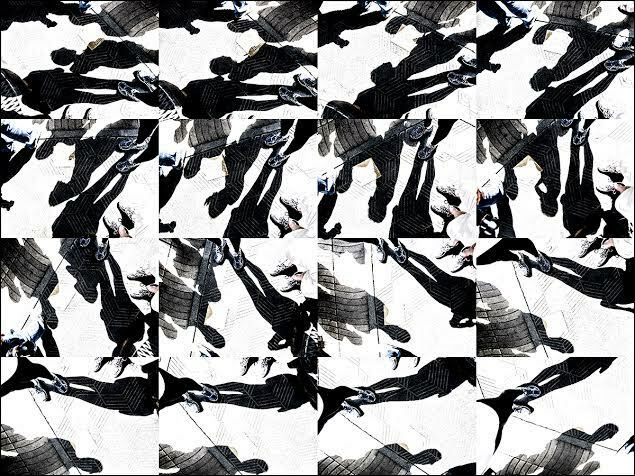 His photo is a playful image capturing his feet and shadow with that of his girlfriend's over tiled pavement; the composition mirrors this subject through a grid of repeated images and shapes. Darryll cleverly creates a square tile from tiled imagery with nuanced changes in direction and placement of the self. Another technical mechanism typical of "The Selfie" is the use of reflective surfaces or mirrors. Darryll plays with this reflective imagery through his "In Vista" photographs. Reflections are the consequence of light, which also happens to be the essence of photography. It is common knowledge that a surface meant to be peered through can act as a reflective devise, dimly tracing our figure as we look on through. A window can mirror in surprising detail the shape of your eyes, even capturing your translucent eye color, reflecting your very being and the environment in which you stand all while revealing what lies on the other side of the glass. 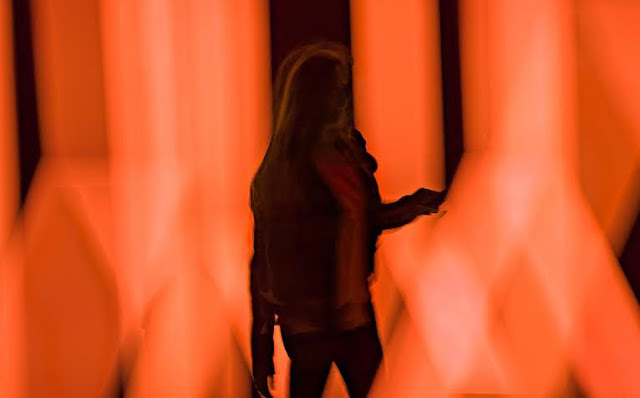 This illusion can be achieved without the aid of a camera, it is a common occurrence to peer back at yourself in the glass door while entering a department store or catch a glimpse of yourself while staring absent-mindedly outside the car window. It makes perfect sense to capture this phenomenon, to photograph your reflection as a selfie. How you depict yourself in this moment defines the nature of your selfie, posing suggestively, throwing a piece sign or documenting what occurs naturally; leaving the blank expression of your face, the shutter closes but a moment and opens as strands of your hair blow out of place. Adopting his own perspective of "street photography" Darryll uses this idea of reflective properties to locate the perfect scene of onlookers in their natural element. The cast of movie-goers stand, facing their reflections clutching tickets in hand perhaps looking for their companions, patiently awaiting their arrival. Darryll's unique style of photography captures the crowd in multiple exposures, gathering their essence in a series of movements overlapping. Other reflective images focus on the mirroring of bodies in movement, too bsy to take note of their reflection, wile others take a quick glance o themselves to affirm an attractive appearance. Other works highlight the technology we are absorbed in present-day. Pixelated and glowing, Darryll calls this photographic body of work "Rapture", where subjects are en-tranced by digital media. Darryll conveys through this series the way we are often washed away by glowing screens and brightly lit words. Through overuse of technology, our personality is lost in an autopilot drone while our eyes are glued to a screen and our bodies wander aimlessly. 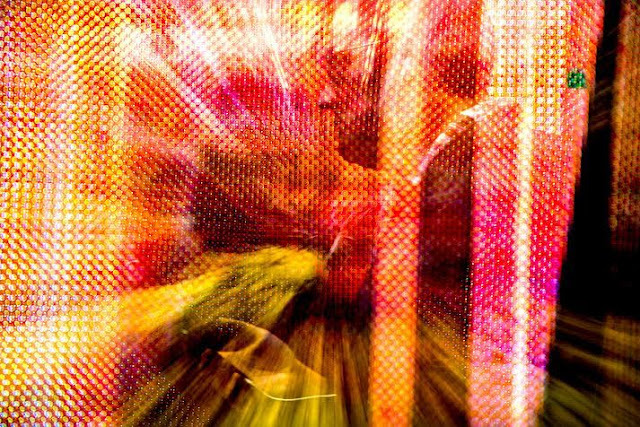 Darryll deliberately shoots his abstract frames as heavily layered images, showing our sense of distraction when confronted with digital media in public places. We wear LED colored lenses, recording our trivial routine and posting it with a hashtag. Darryll's digital process showcases wht it is like to live in the digital era. 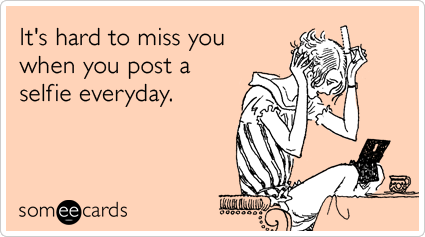 Self reflective or self absorbed we post pictures of ourselves as a common procedure. 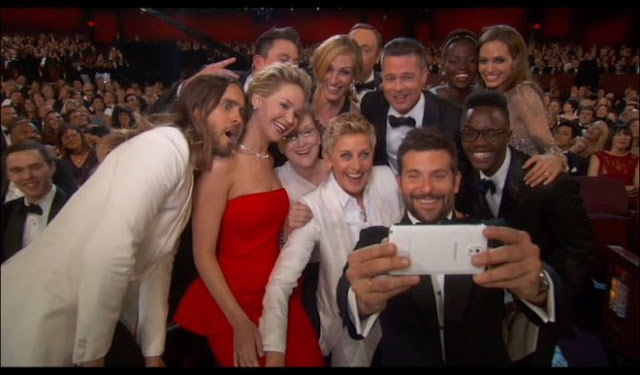 Are these acts truly self aware or are we merely swept away in the selfie?